The BDA is creating a new map to be distributed this Spring. 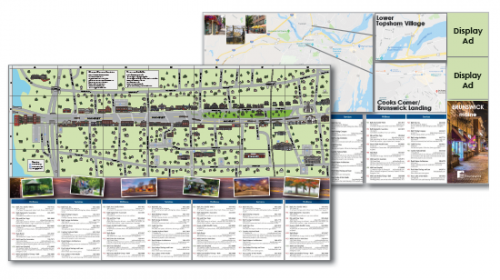 The map will feature an illustrated map of Downtown Brunswick on one side and a Brunswick area map with insets of Cooks Corner/Brunswick Landing and Lower Topsham Village. Local business listings, with grid locator coordinates, will be on both sides of the map. 50,000 maps will be printed. Click here to see the illustrated map! Reserve your space by using the online form below or click here to download the pdf version. Listing is in addition to Business Name, Address, etc. Reservation and payment due April 2nd (end of day). 26.25” x 18” Flat and 3.75” x 9” Folded.